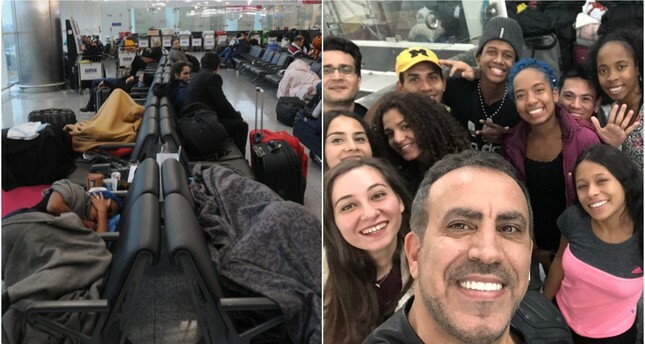 After being stuck at an Istanbul airport in limbo for nearly two weeks, a group of seven Colombian dancers were able to fly home on Wednesday thanks to the generosity of a Turkish singer and Turkey's flag carrier. This summer, the 12-member dance troupe came to Turkey's sunny Mediterranean resort of Antalya to work at a hotel but quit after a labor dispute. Five of the dancers had enough money to buy tickets home, but the others were stuck in the departure terminal of Istanbul's Ataturk International Airport, sleeping on benches and cardboard sheets. After word spread of the dancers' plight, they got better accommodations at a hotel, courtesy of Turkish singer Haluk Levent — known for his charity concerts — and Turkish Airlines (THY). Levent paid for tickets for the dancers to get home, with the help of a discount from Turkish Airlines. After weeks of sleeping semi-rough, the Colombians found themselves en route to the capital Bogota, experiencing Turkish hospitality and generosity firsthand.